uuid : daefb837-4c25-4e7a-abab-6f63681db853 templates_id: 119598 templates_uuid: "2a15bbf3-80f3-4dd2-a139-4a7e0853bffe" title: "Email Disclaimer - Email Disclaimer Template - Create an Email Disclaimer Online" display_name: "Email footer and disclaimer" meta_keywords: "Email disclaimer" description: "
Make sure you include legally required information about limited companies and limited liability partnerships in your business emails with this email disclaimer. 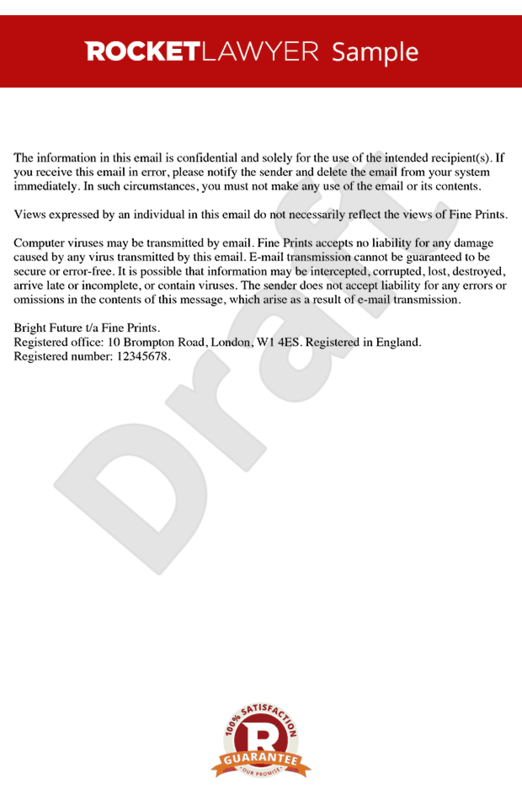 This email disclaimer includes a confidentiality notice as well as an optional disclaimer. An email disclaimer is a notice, or warning added to an email which is designed to try to protect the outgoing sender from breaches of confidentiality, propagation of viruses, contractual claims and employee liability. Why do I need an email footer and disclaimer? and its registered office address. How does an email disclaimer protect me?
" created_timestamp: "2018-10-08 04:37:14.0" modified_timestamp: "2018-10-08 04:37:14.0" active: true created_by: 157 modified_by: 157 dcm_id: 282 url_slug: "Email-footer-and-disclaimer" meta_description: "Create an email disclaimer to include legally required information in your business emails with simple guidance from Rocket Lawyer. Add a confidentiality notice and an optional disclaimer in your business emails. Try this email disclaimer. " time_to_complete: "10 minutes"
reducing the responsibility of your business if an employee sends offensive, obscene or defamatory statements within an email. More than just a Email footer and disclaimer template, our step-by-step interview and guidance makes it easy to create your document. Easily create online, download, print and sign your free Email footer and disclaimer in minutes. This document is also sometimes called: Email disclaimer.